A circular system that has partners working a substantial portion of the billable work produced each year, which leaves very little time for training. 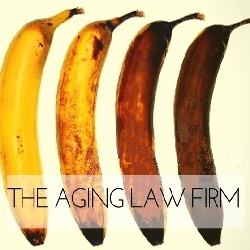 I appreciate the pressures that law firms operate under, but giving into these short term pressures only ensures that the law firm will age, and its cost structure will become bloated. Successful firms are those willing to take a risk on the potential of a talented newcomer rather that settle into a mediocre posture of maintaining the status quo. Attorneys that are not outperforming their peers by the end of their fifth year are more than likely settling into a comfort zone. New people are needed to create a competitive challenge to these attorneys that have grown too comfortable. Competition is the best way to develop potential. Business development is a key criterion for attorney advancement and firm growth. All too often the definition of business development only includes securing new business at some acceptable billing rate. Often these billing rates do not recognize the seniority of the resources used on the client matters. In these instances, the value of the services provided is not reflected in the fees being charged. Frankly, some legal services are only worth so much to a client and a diminishing return to the law firm results. Successful business development also includes a measure of practice development that encompasses staff development. Successful business developers make it a priority to include young team members in key areas of their practice. They sell clients on the quality of their teams rather than any one individual. Training costs notwithstanding, I recommend that law firms be willing to absorb these costs if necessary and create a balanced staffing mix. Firms failing to invest in training risk become out of touch with clients in the blink of an eye. Finally, a system requiring high billable hours from all partners ensures that the workload will be distributed to associates last. Partners are forced to ensure their workload, even if it means working on tasks that are below their skill level. When this occurs, partners become undervalued, and associates are deprived of essential developmental opportunities.